Established in 2000, Birchwood Estate Wines has been committed to producing high quality and affordable wines, all made from Ontario grown grapes. The cottage style winery is located in the premier wine growing area of the Niagara Peninsula. This Niagara winery is proud to produce close to 8,000 cases of wine per year and has one brand available at the LCBO with other wines available at wineries throughout Ontario. The grapes grown here include Riesling, Gewurztraminer, Baco Noir, Chardonnay, Crescendo, Cabernet France and Cabernet Sauvignon. 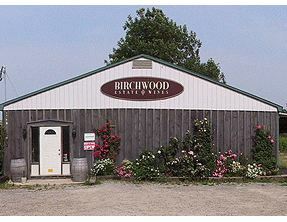 Birchwood produces quality VQA wines and icewines, including the Vidal Icewine made from tropical fruit, honey & peach. This Tour allows guests to make there own tour of the Niagara Wine Country. Travel to Birchwood Estates, Lakeview Cellars and EastDell Estates on your own schedule for either a Touring Lunch or Touring Dinner Package. The cost of the Lunch Tour is $36.95/person and $56.95/person.